Chef Eric Skokan owns a farm and two restaurants in nearby Boulder, Colorado. The farm supplies the restaurants with produce as well as meats, and Skokan even has a booth at the local farmer's market where he sells some of his produce. If local people are even vaguely aware of Skokan, they know him as the guy who uses his own farm to supply his restaurants. It's what he's famous for. 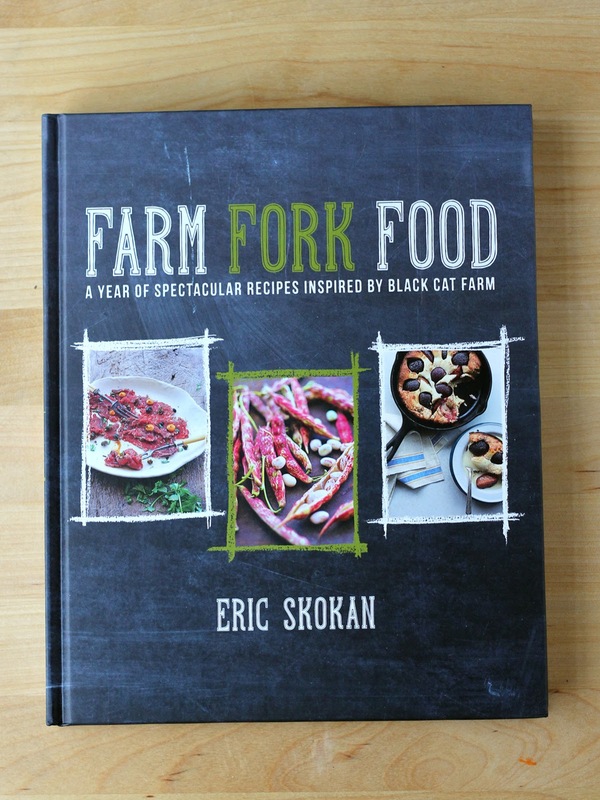 So when I got his new cookbook, Farm Fork Food , I expected to see it focusing narrowly on local and seasonal ingredients. I was quite surprised to see that isn't quite the case. Like many chef-centric cookbooks, this one has recipes that require ingredients that are probably much easier for chefs to get, but much more difficult for home cooks. This isn't really a criticism of the book, because I like challenges, and I like seeking out new ingredients. It's just that the book was so totally different from what I expected. And, if you know of Skokan, it might also be different from what you might have expected. For example, in the seafood section, a large number of the required fish varieties are ocean fish. We're pretty far from any ocean here in Colorado, so those fish aren't local in any sense. And while a restaurant might be able to fly in any sort of fresh fish they want, those of us who shop at supermarkets have to make do with more limited selections. Fortunately, fish can usually be substituted for other varieties, as long as you pay attention to the type of fish called for - firm, flaky, oily, etc., so it just takes a little research to find out what to use instead of cobia or sturgeon. Some other ingredients are pretty far out of the reach of most normal humans. One recipe called for a black truffle, which isn't exactly supermarket fare. Another called for a Bergamot orange, which is grown in southern Italy and is vastly different from standard oranges. After some sleuthing online, I found a few bloggers who had used Bergamot oranges, but they were California-based and even they said the oranges were extremely rare - one orange cost a blogger $7.99. If I saw one, I would probably buy it, but it doesn't seem likely they'll be showing up in my local grocery store or farmer's market any time soon. Another recipe called for Mara de Bois strawberries, which apparently aren't all that unusual for home gardens, but they also aren't a supermarket variety. Dried black chickpeas? That's new to me - no idea if they're hard to find or not. Parsley root? There's something I'm going to have to seek out, but I've never seen it before. There are also a number of recipes that call for foraged foods, and Skokan talks about how he finds these things and harvests them. Which is great for him, but for someone who doesn't forage, it's not like you could simply drive down the road and find the recipe ingredients. You'd need to know where to look, and not get shot by a farmer for trespassing. For the recipe that called for wild rose petals, the flowers from the florist probably aren't going to be a good substitute since they're grown for show and sprayed with things you might not want to eat. I know that Whole Foods sells some edible flowers, but I'm not sure if roses are among them. I'm sure they can be ordered online, though. So while those recipes are possible, they're not going to be spur-of-the-moment meals. On the other hand, there are some foraged foods that can easily be substituted. I made a recipe that called for foraged apples, but I foraged mine at the farmer's market. Wild herbs can be replaced with domestic varieties. There are ways to make these recipes work, even if you live in an urban area where foraging isn't possible. There are also many recipes that don't require as much devotion to ingredient-sourcing, and a savvy cook should be able to make reasonable substitutions. Dried black chickpeas could become normal dried chickpeas, for example. Heirloom turkey breast could become a regular turkey breast, or even chicken. Unusual heirloom beans could become pinto beans. Right now, I have quite a number of recipes bookmarked, and many of them will require no more hunting than a quick trip to the grocery store, while some need only minor substitutions to make shopping easier. To be clear, I didn't expect that this book would use 100 percent local ingredients. We live in a global economy, and I expect that any restaurant (and any home cook!) is going use non-local staple foods like salt, pepper, coffee, spices, and chocolate. I also expect that some produce might come from distant locations - around here you won't see lemon trees, pineapple farms, or banana plantations. Still, given Skokan's reputation, I was surprised how often he featured non-local items. In the end, I like this book, and I like the challenge of seeking out the ingredients I don't have. Next summer when the farmer's market is open again, maybe I'll drop by Skokan's booth and see if he can supply some of the more difficult ingredients. I'd love to score a Bergamot orange and some caul fat. Check out the Apple Butter I made from this book.